Here in the Ville, tomorrow is a big day. The new school year officially begins! That’s right…tomorrow morning, school busses will be rumbling, car rider lines will be jam packed, bookbags worn….and the will be tears…actually, weeping a gnashing of teeth (I’m actually talking about Mamas. The kids will be fine). Did you catch that, Dad? Mom? Grandparents?…We’re to pray! When we think of these words from King Solomon, we often think about our work, our ministry, our “whatever“. Yet, this verse also applies to academics, athletics and really any endeavor our children are engaged in. Now, this doesn’t mean that we should demand perfection from our children this year. It does mean, however, that they are expected to do their absolute best…to do EVERYTHING with excellence. When it comes to the treatment of others, one of my favorite passages of Scripture comes from Ephesians 4:29. Listen carefully…”Don’t use foul or abusive language. Let everything you say be good and helpful, so that your words will be an encouragement to those who hear them”. It’s inevitable that at some point throughout the school year, our children will have the opportunity to step up and be an encourager to a classmate who needs it…a referee when there’s a dispute…a light when there is darkness. IN THE SAME VEIN, they’ll also be given the opportunity to go with the grain and choose to be part of the problem and not part of the solution. Pray that in these moments, high character wins the day! Teaching is a tough gig. The responsibility that weighs on each teachers shoulders in immense. In my book, its one of the most important jobs in the world and because of that (and because the scriptures demand it), we need to bathe our children’s teachers in prayer! In fact, I want to encourage you to pray WITH your children over their teachers this year! In a position of leadership myself, I fully realize the importance of being a true “lifelong learner”. Every day, even in my mid thirties, I seek to grow, to progress, to learn SOMETHING. If that is a need of us adults, how much more so is it a need of the young, impressionable minds of our children. On a side note, I’d encourage you to pray specifically that your child discovers a passion for reading. I can’t overstate how important that is as it will pay dividends throughout their lives. Leader are readers. In the great commission, our Lord Jesus called all believers to go into all the world, preach the Gospel and make disciples. This mandates includes one of the greatest mission fields in the world, our schools. Pray that as God provides opportunity, our children will be ready to show the reason for the hope they have in them…through both word and deed. 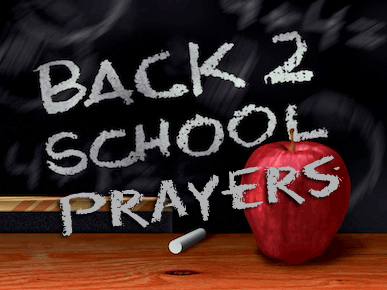 Please know that Double Springs Church is joining you in believing prayer over this school year and if we can serve you or your children in any way, it would be our pleasure!